You’ll be dripping in sweat. You’ll be gasping for breath. Your heart will be pumping out of your chest. And you’ll wonder if you can keep going. You will. And your body will lean out so fast you’ll be begging for more. Whether you're already in insane shape... or just getting started MY Insanity class can help you burn up to 1,00 calories an hour and get you into the shape you want. Get ready to Dig Deep, and push past your limits to get in insane shape! Each week you’ll get better—and do more. Get ready to get in the best shape of your life. Are you up for the challenge? LiveINSANITY is a revolutionary cardio-based total body conditioning program based on the principles of MAX Interval Training. By using MAX interval training, INSANITY pushes the participant to new training heights, resulting in more calories burned, faster results, and a more efficient metabolism. Instructors have been trained to take into consideration the special needs of the participants by providing a variety of modifications. We encourage participants with any level of fitness ranging from beginning to advanced. I want to invite you to check out my insanity class. Class times and dates are still TBD. 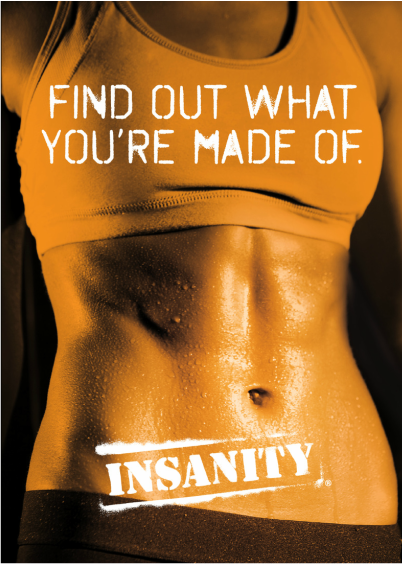 Click here to find an Insanity class near you! 1. Click: "Challenge your self today"
2. Click: "Already have a program? Skip to the next step3. Commit Now"
4. Click: "Sign up or Sign in"
Are you taking a live Insanity group class at a gym? Get Rewarded with a FREE INSANITY T-SHIRT! Just participate in your local INSANITY class and share your results with Beachbody. Enter your "before" and "after" photos, share your story and results to get a FREE T-shirt. Use your sign in page to track your fitness progress over time is to record your body statistics and health markers. YOU'VE SEEN IT ON TV. . .
MAYBE YOU'VE EVEN DONE IT AT HOME. . .